If the news of Facebook's data handling has got you spooked, here's how you can limit third-party access to your account. When it’s time to leave Facebook for good, do it by following these steps, and we'll also show you how to back out if you change your mind. There are plenty of reasons why you wouldn’t want to nuke your Facebook account, but you can still lock it down. The easiest way is to take it private. Head over to Settings, then select the Privacy tab. At the top is a Your Activity window with a drop-down menu. 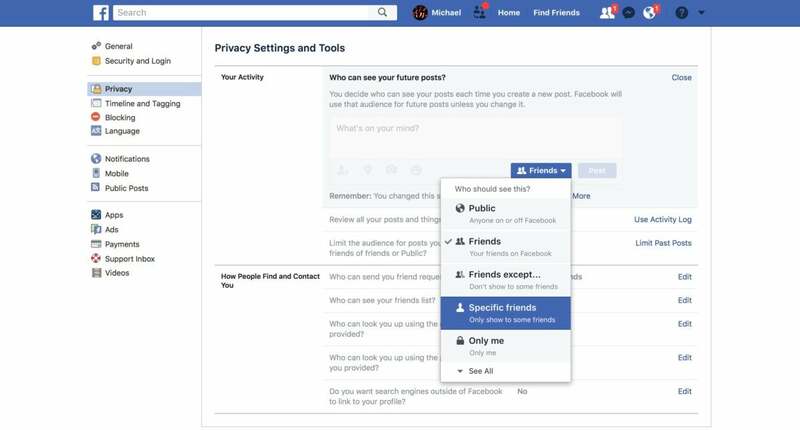 If the “Who can see your posts” option is set to public, that means anyone can see what’s on your page, whether they have a Facebook account or not. Tap the Edit button and you’ll be able to limit view ability to just friends, only specific friends, or just yourself. Further down on the page you’ll find an “Apps Others Use” box. Click the edit button and you’ll see a series of checkboxes showing categories of information that your friends are sharing about you. Feel free to uncheck any box that makes you leery. 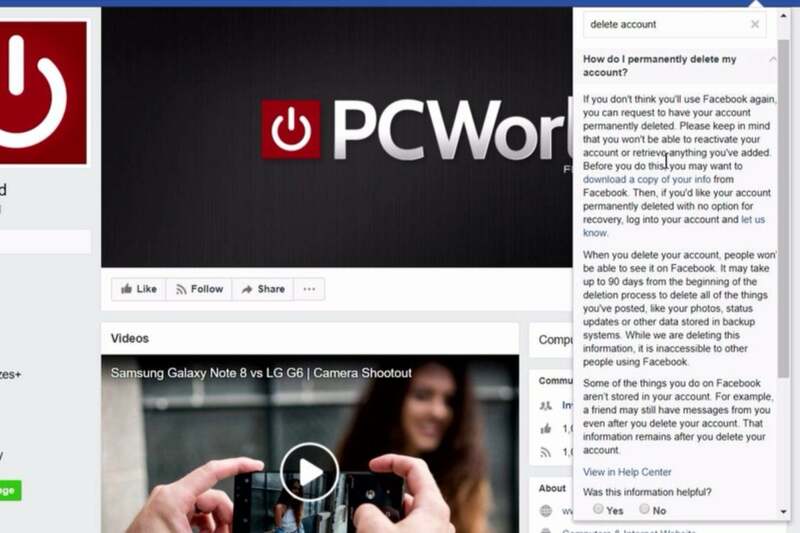 Facebook will let you turn off the tool that trawls your timeline for relevant ad data. And finally, there’s ad tracking. Like any other free service (social or otherwise), Facebook makes a trove of money through advertising, but you can limit how much of Audience Network you see (and how much it sees about you). Click on the Ads tab in Settings, and you’ll see a series of options that let you turn off ads based on your app usage and who can see your likes and reposts of ads. 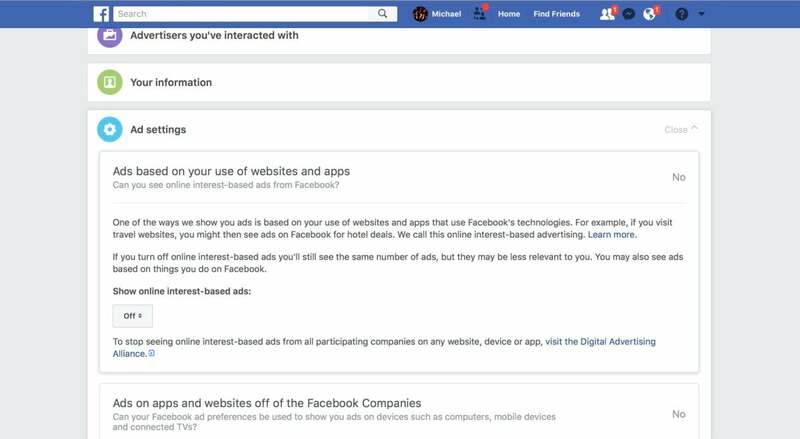 You won’t be able to turn off ads altogether, but you will be able to stop Facebook from using your activity to send “interest-based ads” your way. Go to your Facebook Settings and select General to find the deactivate option. Deactivating your Facebook account puts it on hiatus. Your profile will be removed from the site, as will most of what you posted to Facebook, though messages and other things will stick around). Deactivation can be undone. Facebook will retain your data in case you decide to come back. 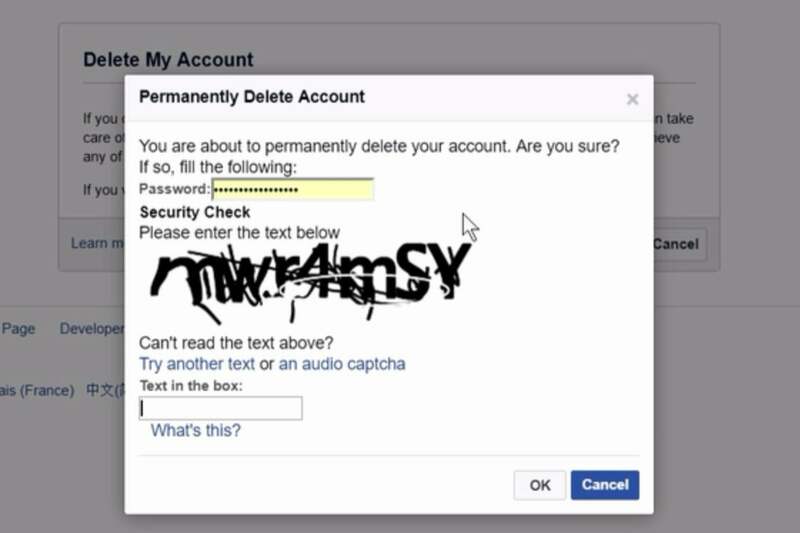 You can always reactivate your account later by logging in to Facebook. If you’re not sure you want to leave permanently, this is a great way to try the Facebook-free life before you make a final decision. To deactivate your account, log in to Facebook. At the top of your Facebook page, click the down-arrow icon at far right. Choose Settings from the menu that appears, and then on the next screen select General from the list along the left side of the window. You’ll find the deactivate option in the Manage Account section. 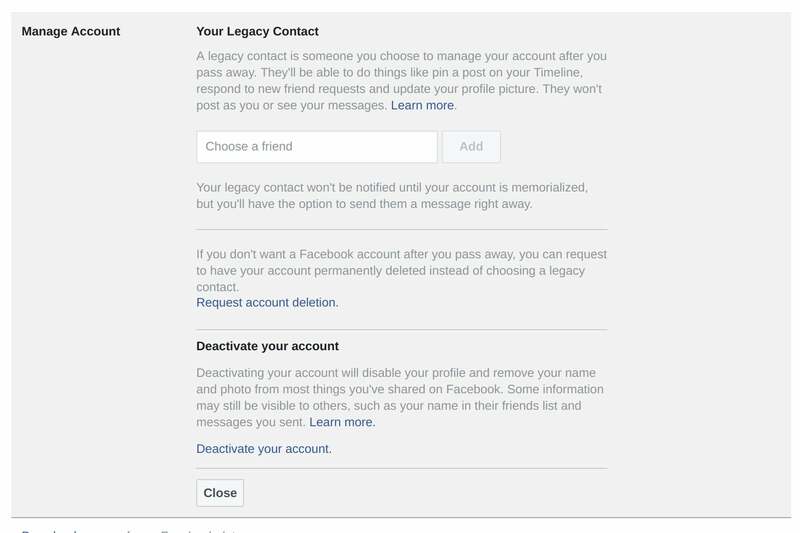 Once there, go to the Manage Account section at the bottom to find the option to deactivate your account. Click Deactivate your account to start the process. Facebook tries to talk you out of deactivating your account, natch, by reminding you of all your friends who will miss you if you leave. Lastly, Facebook asks you why you want to deactivate. The actual Deactivate button is at the bottom. Once you tell Facebook why you don’t want to be friends anymore, click the Deactivate button, enter your password one last time, and Facebook will proceed to deactivate your account. Remember, you can always go back by logging into Facebook. And if you have an Instagram account that’s hooked up to your Facebook one, you can keep it, but you’ll need to unlink them by going to “Sharing Settings” in the Instagram app. Deleting your Facebook account, on the other hand, kills it completely. 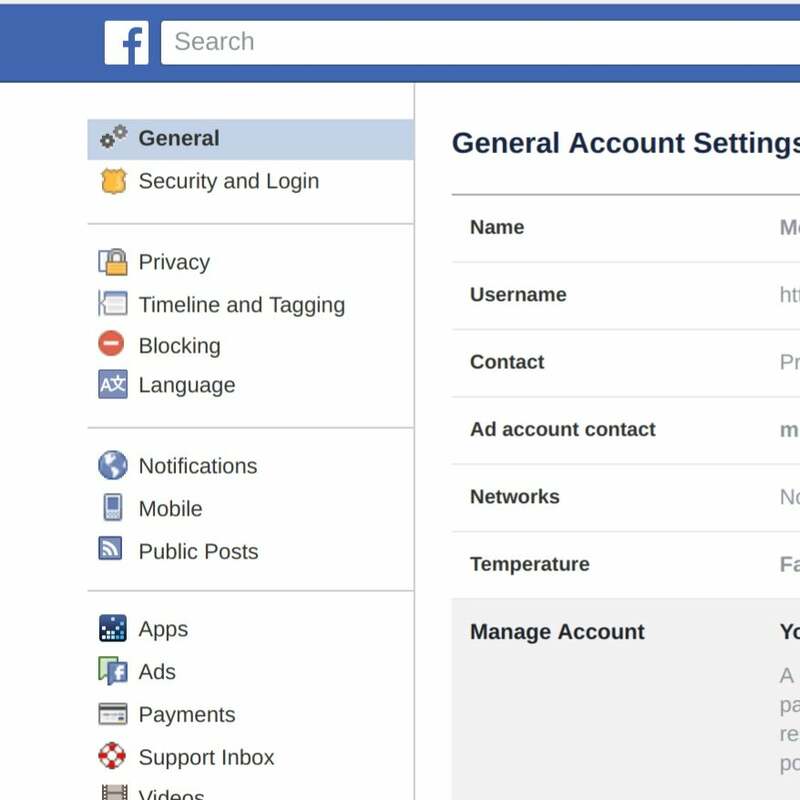 You won’t be able to log back in to retrieve or view anything you’ve posted to Facebook, and if you want to use Facebook again, you’ll have to start from scratch. You can find all the details if you hit the help icon at the top right of your Facebook account page (it looks like a question mark) and type deactivate account into the search bar that appears. Hit the let us know link in this description to start the deletion process. The instructions for deleting your Facebook account are easy to find: Just hit the question-mark icon at the top of your account page and type delete account into the text bar that appears. Facebook wants to make sure you are who you say you are before it deletes an account, so you’ll have to enter your password and pass a text-recognition test to proceed. When you decide to delete your Facebook account, you have to log back in first and prove you’re not a bot. Once you’ve proven you’re not a bot, a Permanently Delete Account dialog box will appear. Take a moment to read the explanation of what’s going to happen. Note the 14-day window to change your mind before your Facebook account is really, truly dead to you. 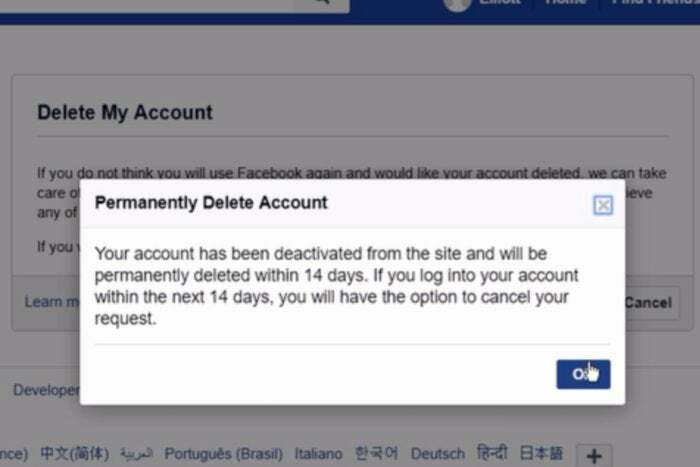 This is it: If you hit the OK button, Facebook will begin the account deletion process. 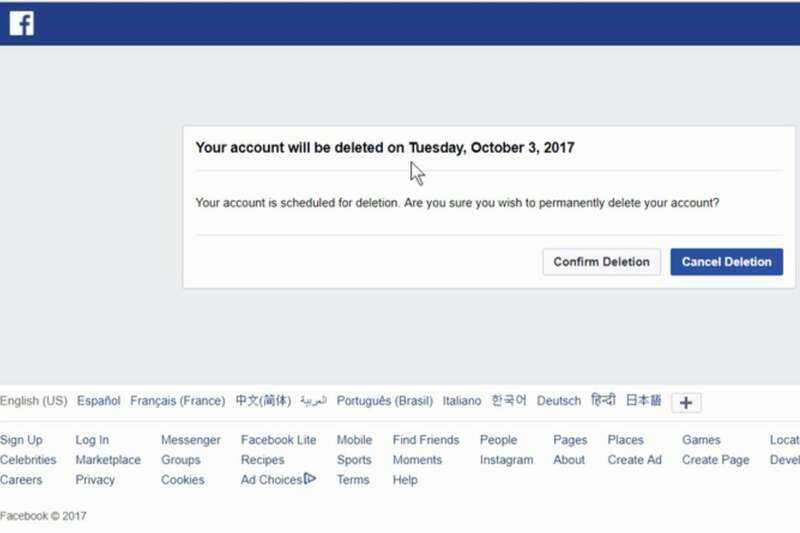 When you delete your Facebook account, you get 14 days to change your mind. If you choose to delete and then change your mind, no problem! All you have to do is log back into Facebook within those 14 days. You’ll see this dialog box where you can cancel the deletion. You have 14 days after deleting your account to log back in and save it from obliteration. Editor’s Note: This is an updated version of an article we originally published on September, 30, 2013. This story, "How to delete, disable, or limit your Facebook account" was originally published by TechHive.